Lots of bits, lots of pieces. And some pizzas. First, check out the great video from Oakland North on Dancing Under the Stars at JLS. 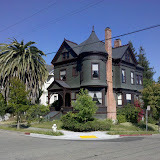 Then check out the mini-vacation/staycation in Oakland, from the Berkeley Daily Planet. Feel some Oakland love from Oakland Magazine. Note the changes around the south end of Lake Merritt, for bikes, pedestrians, and cars. All part of getting rid of the shortest freeway in the world. East Bay Express (and many others) are loving the recent expansion by Boot and Shoe Service. Now they do breakfast, not just pizza! I haven't had a chance to check it out myself, but it sounds promising. Can't say as I'm wild about it. A while back I'd wondered what was becoming of the the sign on the Cadillac / Chevrolet / GMC / Buick building on Broadway. Well, now I know.